English is the official language of Ghana, but not necessarily the first language for many people. The local language in Accra is Ga, but Twi (pronounced 'chwee'), Ewe (pronounced ayvay), Hausa, and English are also widely spoken. Accra has rich modern buildings and dusty shanty towns. Founded in the 17th century by the Ga people, Accra became the capital of the British Gold Coast in 1877. 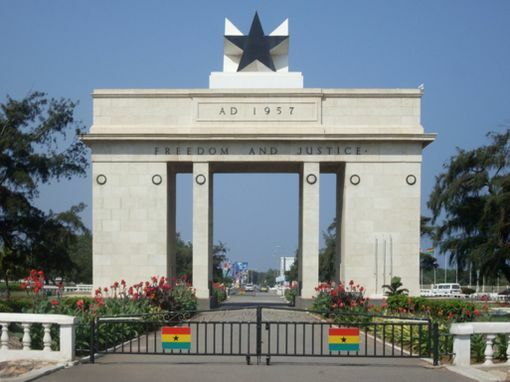 Following Ghana's independence in 1957, Accra became the capital of the newly independent state. Kotoka International Airport(IATA: ACC) is a major hub, with international connections from North America, Europe, Africa and the Middle East, along with internal connections to Kumasi, Tamale and Takoradi, and regional connections to virtually every West African country. In 2018 the new Terminal 3 opened, with the old Terminal 2 being handed over for domestic flights. From the United States, Delta Air Lines operates daily flights directly from New York-JFK. From there, it is possible to connect to all major North, South, and Latin American cities, and the Caribbean. Air Namibia also connects Accra directly with Johannesburg and Namibia. Emirates also operates in the country and Turkish Airlines flies on Mondays, Tuesdays, Thursdays and Saturdays. air viva offers flights to Accra from Kumasi, Sunyani, Takoradi and Tamale. British Airways operate a daily service to London Heathrow. Africa World Airlines operates direct flights from Lagos and Abuja to Accra, and most internal Ghana flights. KLM also operates a daily service to Amsterdam, and from there can connect to almost all European destinations. TAP Portugal has a direct service to Lisbon, Lufthansa runs a daily service to and from Frankfurt, and Air Italy has regular services to Milan; however, inbound services to Accra stop in Lagos first. Since the opening of Terminal 3 it makes more sense to take an official taxi rather than an Uber. Ubers need to pay the GHS10 car park fee (hence are no cheaper than official taxis) and often take ages to arrive. If you don't have luggage and do want an Uber, walk out of the airport and meet your Uber on the street. As with any taxi in Ghana always agree the price in advance, GHS30 should get you to the city centre. The easiest way to get around Accra is by Uber. Uber cars are usually more comfortable than the worn down taxis of Accra. There are plenty of wifi spots throughout the city (e.g. at any KFC outlet) in case you don't have mobile data on your phone. The normal rate is at around GHC1 per mile and you don't need to haggle about the price with the driver. Uprise Travel Ghana phone +233 2 4950 7413 [http://www.http://uprisetravel.com/transport/ is a new Tour company that rent out cars, minivan in Accra and Tamale and a few cars at the Accra and Tamale airport which can bring you directly to Mole National Park and also anywhere across Ghana. Accra's best attractions are scattered across a relatively wide area, so if you can afford the modest prices the best thing to do is hire a car and driver to take you around. Travel companies offer drivers who double as well-informed guides, which helps as interpretive exhibits and brochures (if you can find them) leave much to be desired. If you need an SUV or a sedan there are plenty of affordable options because even the best drivers earn only about USD15 a day in Accra. You can book directly from Avis and local rental companies at the larger hotels, such as the Golden Tulip, La Palm, or Labadi Beach. Cars are available on short notice but if you want a van or SUV it is best to book ahead. Rates for car and driver are about USD9 an hour. For a US$75 you can book a 10 hour day, but fuel is extra. Rates increase if you leave metro Accra, which is fair because poor roads add to the wear and tear on the vehicle. Toyota Land Cruisers are a popular choice and are widely available. Though the city is fairly spread out, Accra is relatively safe to walk around during the day (and night, in many areas). Watch out for open sewers when walking the streets. To flag a taxi wave your arm with your finger pointed down to the ground. On a busy street you will have many taxis driving past trying to offer you their service by honking at you. There are very few Ghanaian cabs with meters. Never get into a taxi without first asking the fare - you must negotiate how much you are willing to pay before you start the trip. It is generally 3 cedis (GHC3) within the centre of town and GHC5-7 to the airport or Accra Mall from the centre. A rough mileage rate would be GHC1.5 per mile. Try to ask someone local how much a trip to a certain location usually costs. Also make sure to haggle hard as most taxi drivers will often try to charge three times (or more) the going rate to foreigners. Relax, and don't show urgency. If the first taxi won't come down on his price, wait for another as they are plentiful. Do have an idea of your route, taxi drivers navigate by landmarks eg roundabouts, traffic lights, petrol stations [not street names, and make sure you have a local simcard in your phone so you can ring someone at your destination and pass the phone to the taxi driver. Taxis do not have to be so private, though, and it's exceedingly rare for Ghanaians to hire one privately (although they will assume that foreigners want a private one). The rate is in theory one fourth of a private ride, but, again, foreigners taking a private ride tend to get taken for a little extra. It's more confusing, to be sure, but chances are they are going in the direction they are already headed, and you can just ask if they're going towards a major landmark, especially a market. 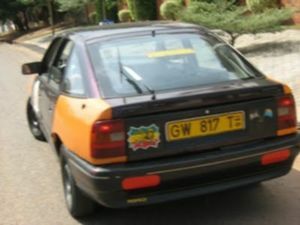 The problem with taxis, aside from the constant honking at foreigners, is that they don't know their way around Accra. No really, they won't have any idea where you want to go. They can't figure out maps either. The landmarks used by locals and cab drivers in no way align with those that are relevant to outsiders. Even worse, the cab drivers usually live kind of far outside the city centre, and usually aren't even familiar with basic neighbourhood names or the biggest attractions like Independence Square! Some useful landmarks that they will know are the major markets, Osu Castle, the Stadium, the financial centre (Cedi Tower), the major traffic circles along Ring Rd, and major street names, from which you can try and direct them to where you want to go. Now, if you don't already know your way around, it's tough. The taxis are not metered. The charging system is at the discretion of the driver. She/He will charge based on the distance, nature of the road, heaviness of traffic and perhaps your looks. Trotros are usually very crowded and dilapidated minivans and minibuses that act as the city's public transit system. They are the cheapest way to travel (fare ranges from GHC0.30-1.00), but can be very slow, especially during rush hour. TroTros travel along well known routes in the city, and stop at various points along the way (some stops have signs, others don't). The trotro system can take some getting used to, but you can ask a local to help direct you to the right route and bus. There are several large bus and trotro terminals in the city and in the suburbs (in Accra: Tema, Tudu, Kaneshie, Circle, etc; American House in East Legon; Madina Market, etc). As a TroTro approaches a stop, a "mate" (the driver's assistant) will usually yell out the side of the window where the TroTro is going. Many people die in trotro accidents every year, however typically those that die in trotro accidents die on highways in rural areas. Accidents causing death in Accra are relatively rare, in part due to traffic congestion. Osu / Omanye Street - emerging as the new hip place in Accra the quiet backstreets of eastern Osu have a handful of trendy eateries, coffeeshops and art establishments. The area is blessed with an absence of traffic (unlike the nearby Oxford Road) and cooling sea breezes. Many Airbnbs are popping up in this area. Labadi Beach - One of the most popular beaches in Accra for tourists. Located between two of Accra's most expensive hotels-- La Palm and La Badi Beach--this short stretch of the Atlantic Coast features several makeshift cafe-restaurants, lots of souvenir vendors, and if you are lucky (i.e. on good weather weekends) an amazing cast of characters who will entertain you with drumming, dancing, pony rides, and acrobatic performances. Some people actually go for a swim, but there's plenty to do on-shore. Don't miss it. (Warning: this is a prime-time venue, one highly "not recommended" after dark.) The beach is 'officially' accessible only from an entrance at La By-pass (Labadi Road) for a fee of GHC15. If you are a guest at La Palm or Labadi Beach Hotel you can access the beach for free through the back gate. Non-hotel guests can enjoy the facilities - pool, fitness, sauna - for GHC10 a day at La Palm Royal Beach Hotel. 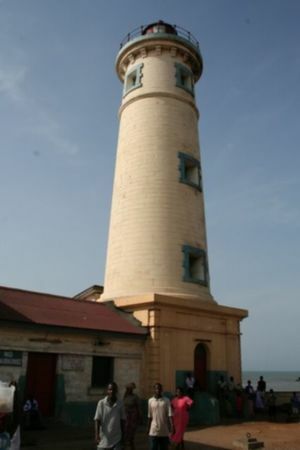 Jamestown - Jamestown is the oldest part of Accra and remains an active fishing centre. It is similar in many ways to Zanzibar's Stone Town, though it has not yet been restored, so it is not typically highlighted on tourist itineraries. Despite this, for many visitors, it is one of the most memorable sights in the city and located the oldest hotel in Accra (Sea View Hotel) now reduced to a drinking bar. Jamestown is a short distance west from Independence Square; from the busy street the only real sights are the lighthouse, a prison building housed inside an old colonial fort(James Fort), and the old Customs House. From the lighthouse there is a road which takes you to the otherwise hidden delight: one of the largest working fishing harbours in Ghana. Go early in the morning and see dozens of small boats bring in the day's catch. It's best to find a friendly local guide so you don't miss the hidden alleys, old stone houses, and fantastic cliff-top harbor vistas. University of Ghana - Ghana's largest university is in Legon and is accessible by Tro-Tros to Madina. It's a very charming and quiet place with old trees, a botanical garden (although you should be aware there have been reports of muggings and violent crime taking place in the gardens) and many small buildings surrounded by green grass. The Cafeterias are open to anybody and serve typical Ghanaian dishes. Harbin's: a bowling alley in Teshie, about 8km (5 mi) from the city centre. Swimming Pools: Sport swimmers find a pool in East Legon at A&C Mall  for GHC12 a day. Those who want to spend a relaxing day at a hotel pool can use the one of La Palm Royal Beach Hotel  for GHC30 a day. Goethe Institut  - German institute organizing frequent movie screening and expositions. There is a regular Thursay movie screening. Alliance Francaise d'Accra  - French institute organizing frequent concerts, art performances and expositions. Local currency is the Ghanaian cedi symbolised internationally and in our guides as GHC (placed before the amount with no intervening space) but sometimes symbolised locally as Gh¢, GH₵, ¢ or ₵ placed before or after the amount. Makola Market, in Accra's busy downtown, includes a large boulevard and several alleys full of fabric shops with goods such as wax-print pagnes, as well as embroidered and beaded cotton and tulle for special occasions. Look for wax prints from Ghana Traditional Prints (GTP) and the Akosombo Textile Company, which issue a wide range of new designs annually. Another source for such fabric is Woodin, an upscale fabric store with outlets in Osu and at the A&C shopping mall in East Legon, selling a variety of shiny patterned cottons, batiks, and ready-made clothes. Kaneshie Market is both a transit centre and a great place to shop, offering a very wide variety of mostly traditional goods and items. It is a source for food and household items; beads, hair salons, shoes, handbags, and beauty products, and fabric shops. For curio shopping, the National Cultural Centre, known popularly as the "Arts Centre" near the Independence Square is an overwhelming but well-stocked option. Smaller curio markets can be found around the city. Wild Gecko (near the Tetteh-Quarshie Interchange, off the Kwame Nkrumah Motorway Extension) sells a variety of crafts, upmarket curios, furniture, and batik clothing. Be sure to check out the extensive collection of Christmas ornaments, including Adinkra symbols carved into dainty souvenirs. Down the dirt road from Wild Gecko are further several smaller but well-stocked pottery and craft stores. Accra is a large city with many different suburbs containing many different restaurants, and other websites give a comprehensive overview. However generally visitors and expats gripe about the price and consistency of Accra's eateries. Prices for an evening meal out can rival or exceed the cost in many western countries, and the quality of both the food and service can vary widely. For this visitor, given the city's large size and voluminous traffic levels, this means that it is often not worth the effort to cross the city just to visit a specific restaurant that caught your eye on Tripadvisor. Eat out at one of Osu's many trendy restaurants. Osu, a suburb of Accra, is known for its nightlife and a wide variety of eateries, hotels, and several options for entertainment. A concept lifestyle eatery, Café Dez Amis is situated close to Osu, next door to Jubilee House and the French embassy. Offering gourmet coffees, sandwiches and salads, as well as cold fresh juices, and ice cream, it has become a hotspot in town, from 7AM till 10PM. Breakfast and fresh baked breads and pastries are available all day. There is also an outside cocktail bar, serving Mojitos and other cocktails from all over the world.It also has wireless access. Located in Labone near the Metro TV building, "Maquis Tante Marie" is a restaurant serving a variety of African cuisines in a pleasant garden setting. Frankie's on Oxford Street in Osu is a popular oasis for tourists in Accra. Offering accommodation, a restaurant, salad bar, ice cream and a bakery/pastry shop. Other popular eateries in Osu include Livingstone Safari Restaurant, Haveli (Indian Cuisine), Papaye (Fast Food), Asanka Locals(Traditional Ghanaian Cuisine) and Noble House Restaurant (Indian and Chinese Cuisine). The biggest entertainment precinct in town is the Oxford Street area, in Osu. Home to over a dozen different night venues (most of them tucked up side-streets), there is no shortage of variety. Taxi drivers generally know the location of the following, but if not, just ask a young-looking person on Oxford Street. Tantra: A late-night (best from midnight to 5am) club, with a 50:50 mix of expats and locals. Plays western style electronic and R&B music. Entry GHC20, small beers GHC5. You can usually negotiate for a discount on the entry charge. Duplex: Possibly the most popular venue as of early 2012, 50:50 expats and locals. Similar music to Tantra, free entry, 5 cedi small beers. Container: One of the original drinking icons, located on Oxford Street. An overgrown "spot" style bar, 90% locals. Good for a couple of drinks in the open air early in the evening, large beers about 3 cedis. Free entry. Street acrobats. Epo's: Another overgrown spot, 80% locals. Located a couple of blocks off Oxford Street, it feels like a mini carnival. Try the "beer tower", a 3 or 5 litre (you choose) tapped tower of beer delivered to your table. 3 litres for 15 cedis, 5 litres for 25, free entry. Monsoon: Quality sushi restaurant, also has a smallish bar. Popular with the over 30 crowd, mostly expats. Bella Roma: A nice Italian restaurant, transforms into a bar/club after 10pm. 60% locals, quite a prominent Lebanese presence. Possible entry fee of 20 cedis. Duncans: A chilled but popular outdoor spot. Ryan's Irish Pub: One of the few places in the area where you can order a pint. An option if you want a rest from Africa, but pretty uneventful otherwise. La Pleasure Beach: Located at Labadi Beach (about 4km from Osu), an outdoor reggae night happens every Wednesday on the beach from 9pm. 10 cedi entry, 5 cedi large beers. 70% locals, foreigners get hassled a little by jewellery/t-shirt sellers, some also offering weed of doubtful quality and origin. It's generally safe, and worth a look on a Wednesday. FireFly: A nice classy cocktail lounge in Osu near Citizen Kofi. Entry is free and drinks are 4-5 Cedis for a single shot and 10-15 for cocktails. Local and Expat crowd. Plays electronic and pop music here you see a lot of foreign (white) young ladies gyrating with public displaying of affection with the local Ghanaian gentlemen. There are plenty of other places throughout the city to discover, but this list is good for new visitors. Shai Hills Resource Reserve - The closest wildlife reserve to Accra and located only 17 km (11 mi) from Accra downtown. Shai Hills is a self-drive reserve so you need to bring your own car. An Uber from Accra downtown to the reserve entrace costs around 50 Cedis (2018) and hiring the Uber for another hour to drive through the park should be around 50-70 Cedis. The entrance fee is 50 Cedis per hour, each additional hour costs 10 Cedis extra. The park is home to over 30 mammal species, among these are antelopes, baboons, zebras and an ostrich. Tills Beach Resort  - the beach resort in Gomoa Fetteh, about an hour drive from Accra, on the road to Cape Coast. Labadi Beach is a clean beach not far from the city of Accra. This page was last edited on 14 January 2019, at 15:58.